MOST ADVANCED RIFE UNIT TODAY! DISCLAIMER: The NEW BCX ULTRA R.F. Plasma Frequency Instrument is NOT a medical device. It is an EXPERIMENTAL electronic frequency instrument. It is NOT intended for the diagnosis, prevention, treatment, cure or mitigation of ANY disease in humans or animals. It is NOT designed to affect the structure or function of ANY system in the body. If you have a health-related condition, that requires medical attention, ALWAYS consult with a licensed health care professional. A MAJOR BREAKTHROUGH in Frequency Technology, the NEW BCX ULTRA R.F. (radio frequency) Noble Gas Tube Rife Unit is built with the ULTIMATE standards for the Professional Scientific Research community and independent Home Researcher. This is NOT just another off-the-shelf Function/Frequency Generator, but is an entirely NEW (based on 15 years experience in Rife Frequency Technology) Solid-State Instrument, designed from the ground-up! 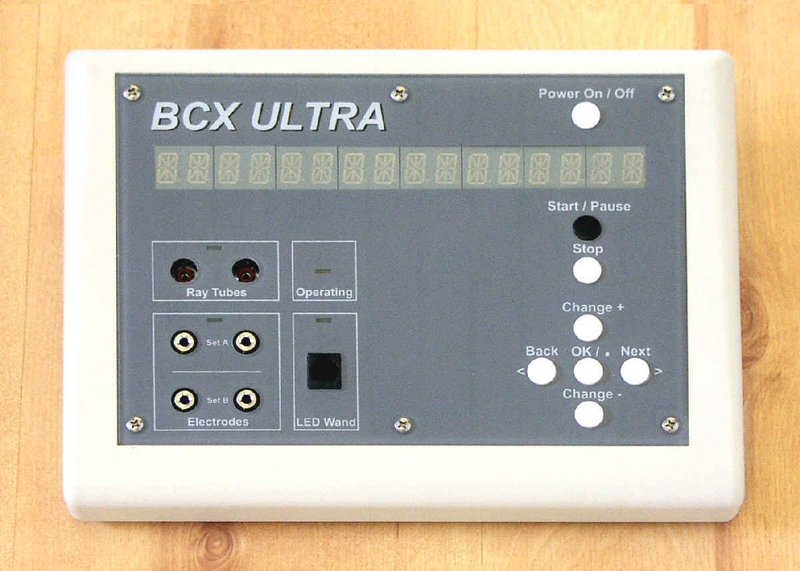 The NEW BCX ULTRA is the result of many years of INTENSIVE Laboratory Research and Testing, which truly brings this Frequency Instrument into the 21st Century with UNEQUALED Precision and Performance! Hundreds of individual researchers have validated the effectiveness the BCX Units. The NEW BCX ULTRA should be the LAST Rife Machine you will ever NEED! The Plasma Ray Tubes are R.F. (radio frequency) powered, which means your selected frequencies are broadcast and penetrate without the type of limitation seen with skin contact electrodes, where the electricity can skim over the surface of the body without FULLY penetrating the skin's natural resistance. While the foot plate electrodes and hand cylinders offer a GOOD alternative for many individuals, there is NO modality, that beats the penetrating power of Radio Frequency pulsations. Simply connect the Argon Glass Tube electrodes and the frequencies are routed directly through the Ionized Plasma Ray Tubes via broad spectrum radio frequencies. This EXTRAORDINARY delivery system is UNMATCHED and penetrates the ENTIRE target area FULLY and COMPLETELY! The energy focus is the most concentrated at the site of application, but also affects the ENTIRE body as well, due to the R.F. Ultra-Sound effects propagating throughout the Lymphatic, Plasma and Cellular Fluids of the body. These harmonic ultrasound resonance frequencies result from the pulsating pressure of the light mass emanating from the Argon Plasma Tubes. This is the same principle that accounted for the observed M.O.R. (Mortal Oscillatory Rate) oscillation effects of the original Royal Rife Beam Tube. The technology is 21st Century, but the Healing Results are the SAME! The High Voltage/Low Current R.F. (radio frequency) Energy ionizes the Noble Gases into a Plasma State. The R.F. Energy then passes through the capacitance of the glass evenly and thoroughly, permeating the desired area, as well as the body as a whole. The R.F. Glass Ray Tubes, being Monopolar, have only one wire connected to each of the two glass tubes, so that when they are used on an area of the body, that area absorbs the Modulated Audio and R.F. Carrier Energy and Frequency, with the return path of the circuit being completed through the capacitance of the body. Stated simply, the body completes the circuit between the two glass tubes. The R.F. Energy is produced by an electronic circuit that derives it's signal from a pulsed repetition rate within the Audio Frequency Spectrum. This pulsed rate has been shown over many years to be of SUPERIOR value much like the benefits derived from normal exercise. Each NEW BCX ULTRA R.F. Plasma Frequency Instrument has a FULL 30-day money back guarantee and a FULL 1 year warranty on ALL parts and circuits, plus any labor involved for the main control unit. LIFETIME warranty against failure or gas leakage for the hand-held glass plasma ray tubes. NOTE: Warranty does NOT cover mis-use or inappropriate use of this research instrument. Total Health Associates stands behind our products 100%. BCX ULTRA Control Module, D.C. Power Supply, 2 - Argon Glass Tube Electrodes, 1 pair - Rubber Skin Electrodes, 1 pair - Stainless-Steel Hand Electrodes, 1 pair - Stainless-Steel Foot Electrodes, Comprehensive Operating Instructions, Frequency Manual (2008), Instructional DVD And Heavy-Duty Plastic Carrying/Storage Case. LED Pad (red or green). The Following Webpages Are Available: Complete Specifications + Catalog (Instrument & Accessories), Operating Instructions, Manual Programming, Operating Hints And Scientific Validation. 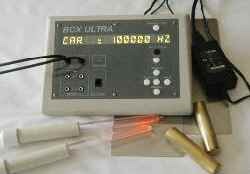 NOTE: I have been selling Rife units for Whitman Technologies, since 1992, when this company had first started manufacturing the BioTec 2000 Frequency Instrument, and then the BCX 211 Frequency Instrument along with the BCX411 Ray Tube Unit and now the INCOMPARABLE BCX ULTRA Frequency Instrument/Ray Tubes Unit! Reading The Buyers Guide To Rife Generators, Then Please CLICK HERE. Seeing The BCX ULTRA Vortex Tube, Then Please CLICK HERE. Seeing The BCX ULTRA Foot Bath, Then Please CLICK HERE. Purchasing The BCX ULTRA Frequency Instrument/Ray Tubes, Then Please CLICK HERE. Reading MORE Information About Royal Raymond Rife And His INCREDIBLE Technologies, Then Please CLICK HERE.